Healthy eating. Juicing, green smoothies and whole foods. For me, it started with the movie Hungry for Change. It was late December of 2012. I had been working out quite regularly and eating healthier. 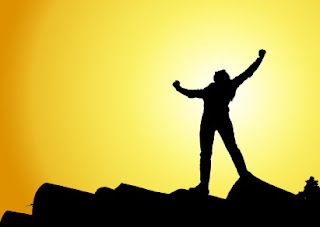 As a result I had noticed a change in my energy levels and overall health and appearance. I was ready to take the next step towards greater well being. I had already been interested in juicing after it had come up a couple of times in conversation. I recommend starting with a juice fast, primarily because that is what worked for me. It was the beginning of 2013, the perfect time for resolutions. The juicer I initially bought and we were quite happy with is a Breville BJE200XL Compact Juice Fountain 700-Watt Juice Extractor . I was quite intimidated initially about what to put in the juice, how to find recipes that I would like and how to possibly keep enough produce stocked in the house to support my new juicing habit. I have to admit it was quite daunting. Having a very supportive husband who was happy to participate in my dramatic culinary revolution has made it a whole lot easier. I inadvertently discovered a temporary solution the intimidation I felt at the prospect of making my first juice. It happened at the juice bar at Whole Foods. I knew from the documentaries that I had watched that I wanted to get a lot of chlorophyll, which has quite potent healing properties. 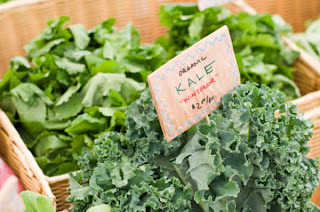 However, I had never liked any of the greens (green leafy vegetables) that seemed to contain large amounts of chlorophyll, such as kale, mustard greens, and collard greens. 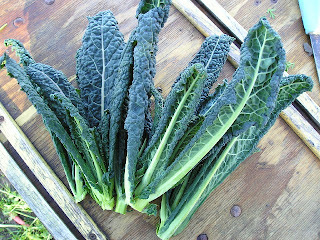 As a result, I knew I needed other ingredients with strong flavors that would mask the kale flavor. The Green Machine juice at Whole Foods, or a variation there on, became a staple for me in those first few weeks. The Green Machine contains: cucumber (unpeeled if organic), peeled lime (leave as much pith on it as possible), 1-2 sticks celery, kale, and apple. I adopted this recipe with minor adjustments. Although I love the taste of whole celery, I do not enjoy the flavor of celery in juice. I also have taken a break from the lime recently. Instead, I include ginger root (1.5 thumb size piece, unpeeled in organic) for spice. It has a strong flavor, but be careful because it is easy to over do it. Parsley and kale bunches are my favorite greens combination. Parsley has strong cleansing properties and a pleasant flavor when mixed with the kale. 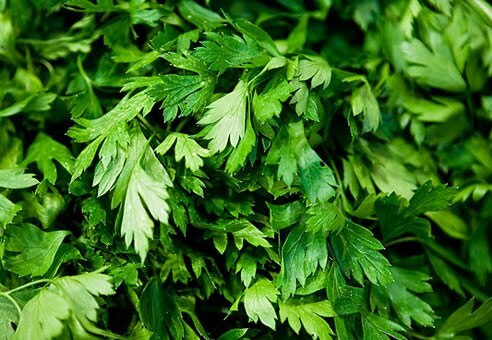 Also, I find there is frequently an abundance of fresh, inexpensive organic parsley at our local markets. Two carrots also are usually in my morning juice. They can be unpeeled (if organic) and although I usually cut off the ends, you don't have to. One discovery about carrots is that their tops (green leafy parts) are exceptionally healthy, and so now I've begun buying carrots with their tops when available. However, the tops do not last long in the refrigerator, so I usually cut them off and use them all in the first juice I make after returning from the grocery store. Apples! Apples! Apples! These are fantastic in every juice And quite necessary. 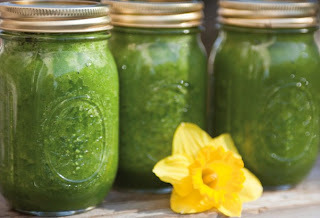 You can control the bitterness of your juice (from the kale and other greens ) with apples. I will usually use two small apples, or substitute some pineapple (with rind if organic) or pear when available. 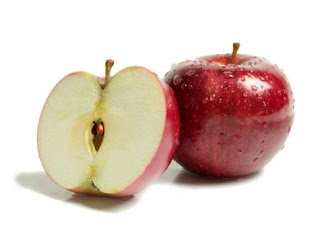 The nice thing about juicing apples or pears is that you don't need to core the fruit. Rather, rinse well and cut into wedges that will fit into the juicer. With the Breville, I simply quarter the apples. Cucumbers are a great juice neutralizer. Now matter how bitter the green may be, the cucumber will soften the flavor, and with the apple and a little ginger, the green flavor is muted to a much more palatable, subtler flavor. Remember, if you can't find organic cucumbers, peel them before juicing. 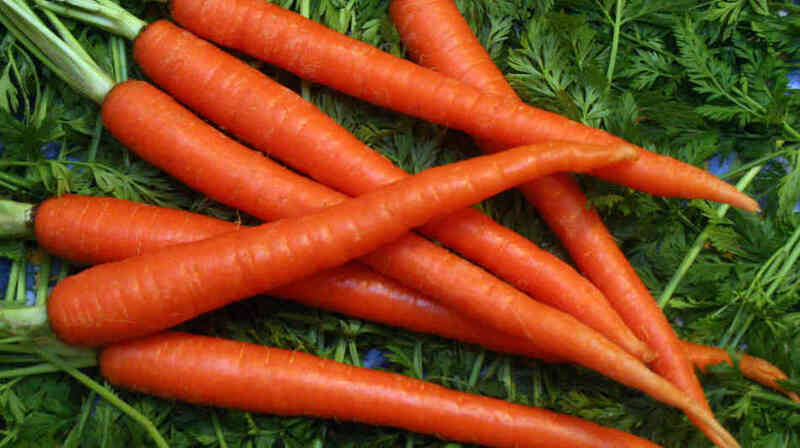 There are a lot of nutrients in the skins though, so buy organic when you can. The thing about the juices I was making, as I soon discovered, is that one is strongly encouraged to drink the juice as soon after being made as possible. Apparently the juice's healing properties start to dissipate shortly after the fruit is juiced. The speed at which a juice loses its healing properties is correlated to the manner in which it is juiced. Briefly, the fast centrifugal process (like my Breville) will create a juice that quickly loses its health benefits. Whereas the slower, masticating juicers (more expensive, slower to juice) produce a juice that will maintain its health giving nutrients for a much longer period. Fat, Sick and Nearly Dead, Hungry for Change, and Forks Over Knives. 50 days in and I find myself returning to Netflix to find additional inspirational documentaries on diet and health. I have revisited films I had previously watched, and continue to learn and maintain my momentum from, in part, the personal stories that are featured in these films. Movies are great, but I have been equally excited about expanding our library with books about healthy eating. Initially I had just happened upon Green for Life , and Green Smoothie Revolution by Victoria Boutenko in the grocery store. This book opened my eyes to the world of green smoothies! I have plowed through about 10 or 15 different books on the topic in the last month, but hers is really good and the content has seemingly valid science supporting her claims. I have also enjoyed Eating for Beauty and Superfoods by David Wolfe. I am waiting for Healing the Gerson Way, by Charlotte Gerson to arrive. 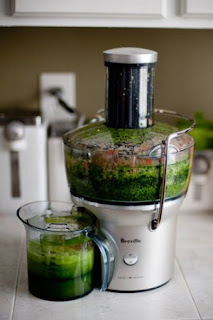 Boutenko is definitely in the “green smoothie” camp, which advocates blending greens in a blender as opposed to juicing. I found a number of things about green smoothies compelling. I had been juicing for a few weeks at the time, and I was growing a bit weary of chasing juices around town for every meal. Since the juice's nutrition expired so quickly, it was becoming cumbersome to try and find enough juices to keep me full during the work day. Increasingly there are more and more juice bars popping up around town, but I was still finding traveling out of the city during the day quite daunting since I knew there would be no juice bars in places like Douglasville, Georgia. As a result, I was primed for a juice alternative that I could prepare in advance at home to last throughout the day. Also, as Boutenko pointed out in her book, although juicing provides large quantities of nutrients, juicing removes the fiber from the plant. Without fiber, you are depriving your body of the materials necessary to pull the toxins out of your body. 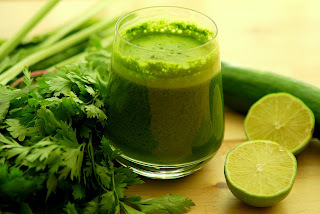 And since, a large benefit of juicing is the "detoxification" Boutenko, rightly I think, questions the efficacy of a detoxification process that excludes the very necessary component of fiber. Thus, green smoothies provide both the nutrients and fiber necessary for the most effective detoxification. Boutenko also discusses the importance of rotating your greens. In nature, animals tend to graze from green to green. The idea is that animals should consume some amount of many different green plants. As a built-in self-preservation mechanism, greens contain a small amount of toxin. This is to prevent animals from over-consuming the plant. It encourages animals to graze from green to green in the wild. Boutenko encourages us to rotate greens as frequently as possible. Thus, although spinach is hands down the most pleasant tasting green in smoothies, Boutenko reminds us that it is important to consume an assortment of greens. Boutenko also stresses the importance of finding recipes that taste delicious. She advises that you should always be looking forward to your next green smoothie. Especially for those of us just starting out, we want to develop the good and regular habit of consuming these delicious drinks. Nothing kills a good habit like a bad tasting smoothie. Don't rush to eliminate the fruit or sweet tasting ingredients. Make sure you make it a pleasant experience and the habit will be easy to keep. I discovered a concoction (not quite a green smoothie) that has become very popular in my house. My 2 year old loves her "Ice Cream Smoothie" which consists of 1 banana, 3 handfuls of ice, 1/2 cup almond butter and 1.5 cups of whole milk, 3-4 tablespoons of agave nectar. The ice and milk combo gives it the consistency of a milkshake. Although the dairy and added sugar are ingredients that I typically avoid in my smoothies, this smoothie has become a regular evening snack. My routine as it stands right now (and I am constantly refining it) is to juice twice in the morning. Once before I go to the gym, and once again before work. I will make my green smoothies in the evening and typically drink about two quarts per day. Lately I've discovered frozen organic fruits to be a quick and easy addition to my smoothies. As I mentioned, stocking and storing enough produce to sustain this type of diet for even a small family is a serious endeavor. Frozen fruits help supplement my options, and keeping things interesting is definitely important if you want to stick with this change. Only because I care so much...I have to draw your attention to a recent update I have made to an earlier Muffins post. It would really be in your best interest to check out the Ginger-Pear Muffin recipe that has been added at the bottom. Absolutely scrumptous! 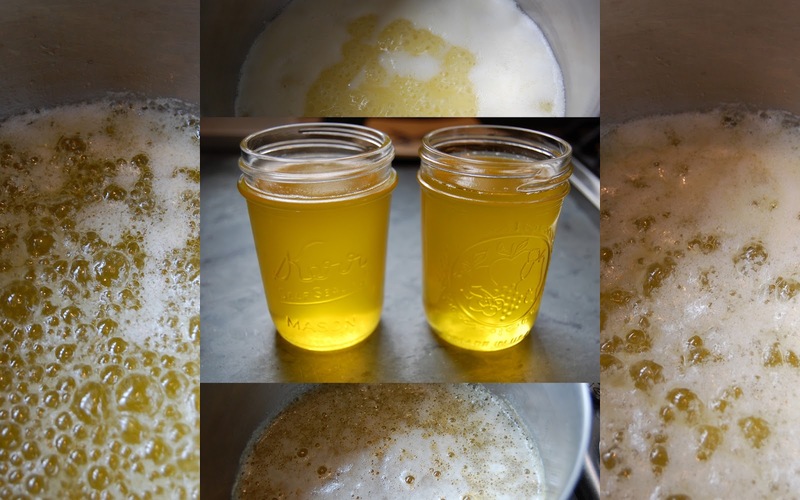 I have updated my ghee post which includes instructions for making it at home as well as pictures to help you along the process. I have listed kombu as one of the ingredients in several of Myra's recipes. 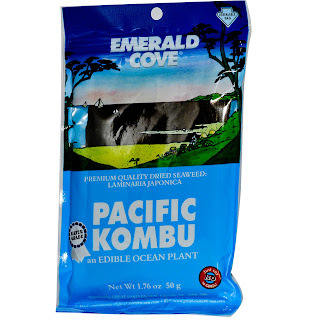 Here is what kombu looks like and it can be found in the Asian section of your local health food store. 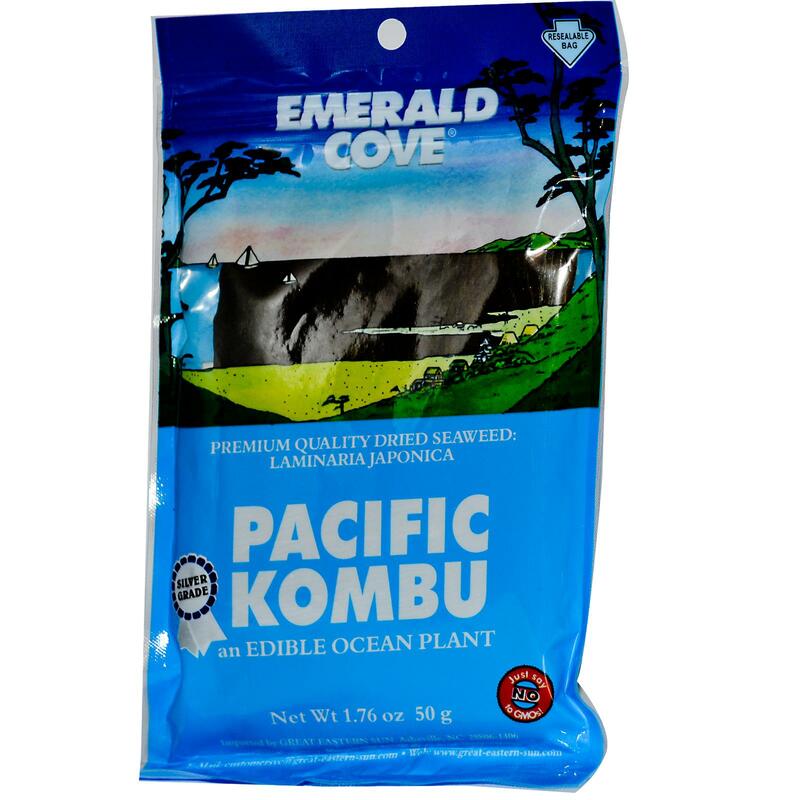 Kombu is harvested from the deep, cold waters off the northern coasts of China, Korea and Japan. Growing in dense underwater forests, the individual fronds of this nutritious brown algae can reach a height of 30 feet or more. After harvest, kombu is laid out to dry slowly and naturally in the sun and is then packaged. 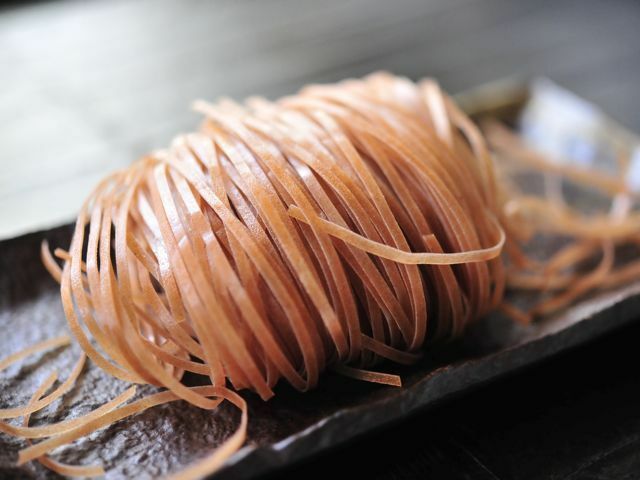 Kombu is used in a wider variety of Japanese dishes than any other seaweed and is prized for its flavor-enhancing qualities as well as its ability to make beans more tender and easier to digest. It has a sweet, delicious flavor and is most often used to produce a flavorful liquid called "Dashi", a multipurpose stock for soups, stews and sauces. This simple dish is the first step in the preparation of many traditional Japanese and other Asian recipes." Here at Myra's we have been consuming about 1/2 an avocado per day. As it turns out, avocado goes well with almost any dish. Since avocados tend to be fairly expensive it is important to know how to pick the right avocado and how to keep it ripe as long as possible. When choosing an avocado be sure that it still has a bit of its stem intact. This way the avocado will be sure to ripen properly and it will also keep any ants out. 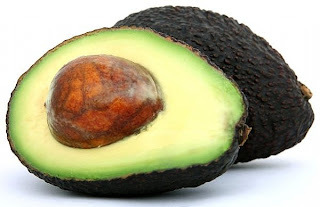 If you find you only intend to use half of the avocado and you wish to save the rest for later, keep the pit in place in the half you are storing. Believe it or not leaving the pit with the leftovers will keep the avocado from going bad longer. We enjoyed our pesto on brown rice noodles, but you may use any type of noodle you like. Pack blender with all the ingredients. Slowly blend it (you may need to add some more water). This may take some time, so don’t worry if it doesn’t happen magically. You may need to blend and stop and stir mixture and then return to blending until mixture is smooth. Then toss cooked noodles with pesto. Serve with pine nuts (or almonds) and sheep feta cheese. Enjoy. Chop vegetables. In wok, heat olive oil put in some oregano and water. Stir-fry in part and steam in part the vegetables, just BARELY cooking the vegetables. Serve vegetables tossed with pesto noodles or on the side. Here is some useful information on various common spices. Please note that it contains some information that pertains specifically to ayurvedic principles. However, if you are not interested in ayurvedic cooking, you may still find these hints meaningful and helpful. It never hurts to try something new. Asafoetida (also referred to as hing) is the dried latex (gum oleoresin) exuded from the living underground rhizome or tap root of several species of Ferula (three of which grow in India), which is a perennial herb. Asafoetida is extensively used for flavoring curries, sauces, and pickles. It is also used in medicines because of its antibiotic properties. 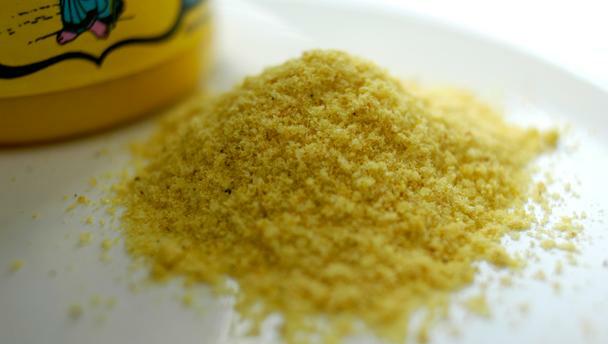 Asafoetida can be purchased from your local health food store for under $5. Adzuki beans are easily assimilated, or rather, your body readily absorbs the nutrients available in adzukis. They are a tasty bean and are fairly inexpensive. 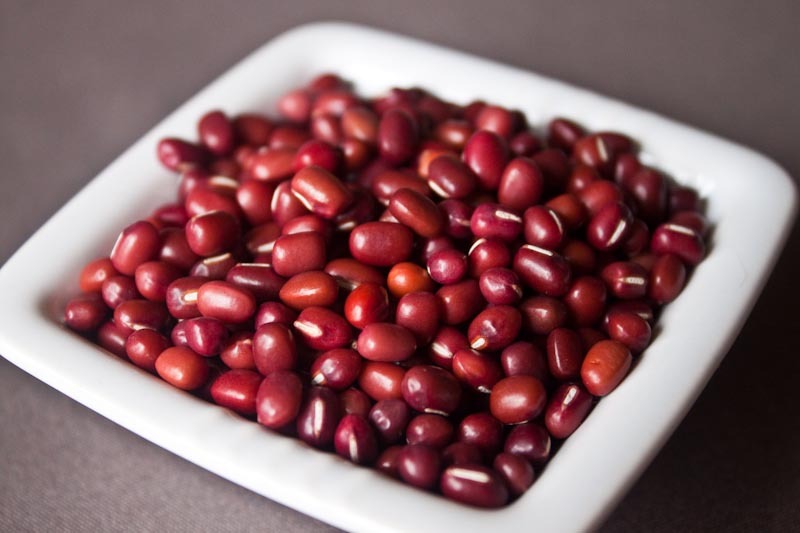 Adzuki beans can be found in the bulk section of your local health food store. This is a VERY tasty hummus and tabouli dish that is very simple to make although takes some time and planning. I promise that the results are well worth the wait. A fantastic summer meal. Soak adzukis and garbanzos over night. Drain. Then add some hing (few shakes) and kombu. Put in pot and add water so that there is one half and inch of water above the mixture. Bring to boil. 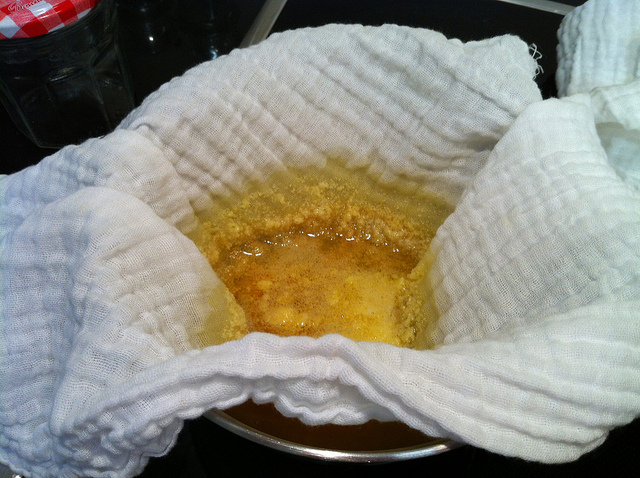 Turn it down to simmer once at boil – cover leaving lid slightly ajar allowing for steam to escape. 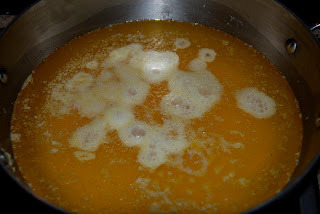 Let simmer until soft (around an 1 to 2 hours). Be sure to heck in on them after the first hour. When done let cool off a little. Then put them in the blender (fill 1/2 to 3/4 of blender at a time). Add to blender some of the liquid left from pot in blender with beans. Add olive oil, 3 tahini, mustard and squeeze in half a lime or lemon. OPTIONAL ‡ you may add a splash of braggs (1-3 tsp depending on individual), a few shakes of cayenne pepper. Serve as is or garnish with parsley or cilantro and a couple of chopped chashews. Put bulgar wheat in a bowl. Add water to bowl (may need more depending on the humidity). Let it sit for about an hour. Check it, it should get soft but still be chewy. There should be no excess water. Finely chop up parsley, cilantro, cucumber and tomatoes. Add these to wheat with the black pepper, olive oil and lemon or lime. Then that is it. 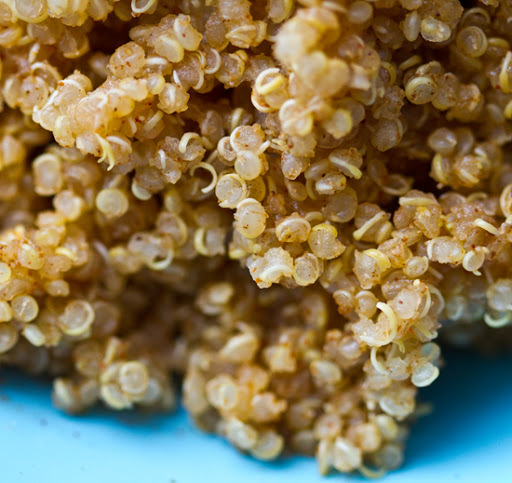 Quinoa (pronounced 'keen wah') is actually a seed, but commonly classified as a grain. It has a light, delicate flavor. The grain is flat and oval with pointed ends. Varieties range from yellow to red, brown and black. When talking about the whole grain (and we are) it MUST be rinsed before you use it – or it can make you ill. You can also buy it flaked for hot cereal. Quinoa can be purchased at your local health food store in the bulk section. 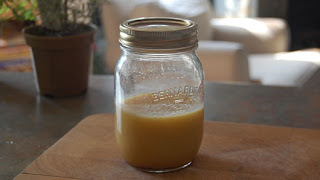 Although you can certainly find ghee at your local health food store you might find that it is cheaper and more rewarding to make at home. 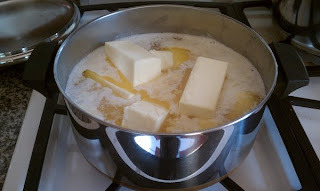 You can and should use ghee as you would normally use butter. Tastes great on almost anything - especially muffins, bagels and all other bread foods. Although the taste seems unusual at first - maybe a distant cousin of butter, your palate quickly adjusts and soon you forget why you ever found butter compelling in the first place! Place it in a nice heavy stainless steel saucepan (not teflon or aluminum). Then you melt it and bring to a simmer and it pops (it talks to you). Then you let it simmer (be in the area). It depends on how much you put in there, thickness of pan and cook top. When it stops popping it is ready. It will form foam on the top and some skim on the bottom. Once it starts simmering don’t mess with it, don’t touch it or add water or anything. Let it be! It will turn amber when it stops popping and you MUST get it then otherwise it will burn. Remove from heat and let cool just long enough to be able to put through strainer or unbleached cheese-cloth. Pour it into mason jars (best because it has a seal) – should be clean dry mason jar. Keep it on a shelf inside a cupboard. It will stay good for a LONG time. Once you open it you must dispense with a clean utensil and no water can get into it or else it will mold. It is used medicinally in aryuveda and draws accumulated toxins out of your system unlike butter, which is congesting. It also does wonders for your skin and your hair. 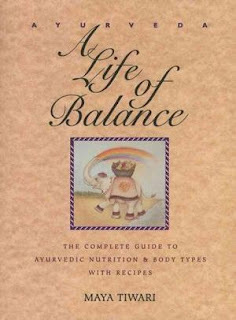 More on Ghee from "Ayurveda: A Life of Balance"
Ghee is one of the most ancient and sattvic foods known. Used judiciously, it is ideal for cooking as it does not burn unless heated excessively. It synergizes with the food nutrients and nourishes the bodily constituents. It also serves as a base for herbal ointments to treat burns, skin rashes, and other such conditions. 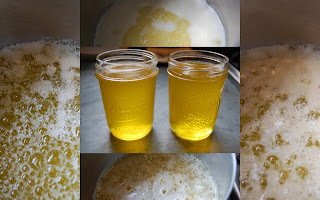 Ghee is good for all doshas and is a specific for Pitta. Minimal use is recommended for Kapha types. This is a great fall and winter soup. It has a subtle and mellow taste with a hearty texture and is suitable for the main course of either lunch or dinner. We had some stir-fry on the side with some crackers and avocado. Soak split peas, Chana dhal and Urid dhal for (not quinoa) for 1 to 2 hours. Pour water off add quinoa. In large pot bring mixture and 9 cups of water boil. Put it on very low simmer for 2 hours. Serve. NUTRITIONAL NOTE: Both Chana dhal and Urid Dhal are generally enjoyed in the colder seasons as they are very heavy. Mung dhal on the other hand is great for you winter, spring, summer or fall. Crunchy, earthy and tasty. mmmmm. This is an excellent summer meal and a good pick if you are entertaining guests. It is very easy to make and appealing to even the most feisty of palates. Stirfry vegetables with olive oil and oregano. Add fresh basil when vegetables are almost finished cooking (if you are using dried basil then add with oregano). Cook noodles separately. When noodles have reached desired tenderness strain and add olive oil. Combine noodles and vegetables and then lightly sprinkle a bit of chili pepper. For dessert we had some of Myra’s homemade yogurt, blueberries warmed on the stove and sugarless apricot sauce (but apple sauce will do in a pinch). This dhal soup is made from split mung beans. It is a nice and healthy addition to any dish. This dinner was actually prepared by Z and I. Although it didn't turn out quite as well as Myra's did we are still working on it. In addition to the dhal soup we had sweet brown rice with coconut milk, mixed lettuce with apples and raw milk cheese on top. It was very tasty. Let mung beans soak in water for an hour or two prior to cooking. Then drain mung beans. Combine 4 cups of water, mung beans, ghee and cumin in saucepan and bring to a boil. Then simmer for 30 minutes. This is a very flexible dish and you may play with various ingredients. For instance, adding some coconut rounds out the flavor some. Goes nicely with salad and rice. Also if you want the dhal to be thicker - i.e., not soup try skipping the soaking step OR use around 3 cups of water to cook the beans in instead of 4. This dish was served with quinoa(and raisins), avocado, Ryvita “Flavorful Fiber” crackers, and fresh figs from the garden. As discussed earlier, adzuki beans are easily assimilated - or rather, body friendly – and your body can readily absorb all the nutrients the bean has to offer. Similarly, the garbanzo bean is ranked rather high in the bean hierarchy. Together, the adzukis and garbanzos make for a winning combination. The dish has a quietly bold flavor that rests comfortably on the palate. For those of you who have been following meanderingfood, you may have noticed that many of the recipes posted call for an ingredient called "Bragg." Well, here it is - Bragg - in all its glory. And it can be yours for only $2.99 (or somewhere around that neighborhood). Bragg is liquid aminos - an all-purpose seasoning made from soy protein. It contains an alarming number of amino acids and can be used on a variety of food including salads, soups veggies, tofu, rice and beans and much much more. Please feel free to check out the Bragg site to read more and I urge you all to give it a try. For those of you who know me - you know that I can be VERY discriminating about food and seasonings. This is a healthy and tasty alternative to soy sauce and other seasonings that are comparatively lacking in health benefits. This dish is easy (and quick!) to prepare and very tasty. It's a stir fry of quinoa pasta and vegetables and herbs. 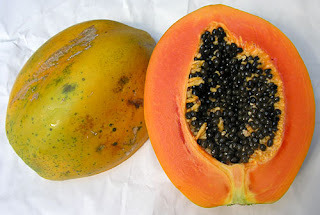 As you can see above, we ate ours with avocado (from a neighbor's garden) and papaya (from our own). In a wok, heat olive oil, dried oregano (if you have fresh, add it at the end with the basil instead), a pinch of cayenne pepper and sun dried tomatoes. 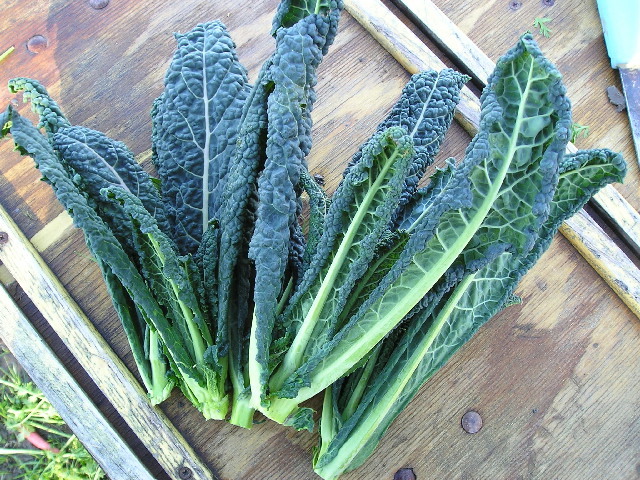 Next add broccoli and include peeled stems, too (many nutrients are in the stems). Also add tofu cubes if desired. Cook and add water if necessary. At the last second, add the fresh basil, sheep milk feta, and the arugula. Turn off heat and let steam with lid on for 2 minutes before serving. Toss with Quinoa. Serve immediately. This is Myra Lewin, the genius behind the food - and this is her kitchen. We all have her to thank for the delicious food. Enjoy the various dishes and send happy thoughts and energy her way. You absolutely must try this avocado dressing! The recipe is very simple and the result is outstanding. This dish also included oats and millet, summer lettuce, carrots, cucumber, cottage cheese and, oh wait yes, my muffins. This meal was by far a favorite of mine and z's. Use your superior culinary skills and play with the amounts of each. Blend and serve on salad or pasta. So here is my first attempt at one of Myra's specialties. I have been a bit obsessed with her muffins and so here are mine. They came out quite tasty. Be prepared however, for the consistency is not light and fluffy. Think more along the lines of healthy muffins! To peel the almonds, soak them in hot water - loosening the skins so that they come off easily. Mix the dry ingredients into the bowl. Add the remaining ingredients and mix. It tastes better if you use your hands to mix the dough - but if you do use your whole hands and not too much fingers...you want the dough to retain as much air as possible. Since we are not using yeast or baking powder the more air in the dough the better as it allows the muffins to rise a bit and gives them a lighter, fluffier feel. Then add water - use your best judgment when determining the amount of water. The dough should hold together pretty well, but all the four should be absorbed. Cover the bowl with a towel and let sit for 8 HOURS. Spoon the dough into muffin pan. Heat oven at 350 degrees. Bake about 13 minutes or until desired consistency. NOTE: you can add whatever kinds of fruits and nuts that you wish. This is a very flexible recipe, so have fun with it! Blend chayote squash, yogurt and cumin. Serve at room temp or chilled. Garnish with cucumber and cilantro. Cooking and eating are not to be rushed. They are to be a prayer. A gift of love. It is of family. It is standing in the company of your ancestors and feeling their hands helping you. Everything that matters happens in the kitchen. This dish included papadam, steamed greens, rice, avocado and split mung dhal. Split mung beans are at the top of the bean hierarchy as far as nutrition is concerned. Wash split mung dhal until water runs clear. Soak in 3 cups of cold water overnight. Drain. Boil 2 cups of the water and add dhal, turmeric, and salt. Cover and simmer over medium heat for 50 minutes. In a small skillet, heat ghee and brown chili pepper, ginger, and cumin seeds for a few minutes. Add the powdered spices toward end of the browning. Add to dhal with lemon juice and remaining water. Cover and continue to simmer for an additional 30 minutes over low heat. Myra's adzuki beans with greens and rice! this is a nice energizing lunch. Adzuki beans are easily assimilated - which means that the overall nutrition is greater than many other kinds of beans because your body can digest and absorb more of the protein and goodness. soak the beans 6-8 hours. pour off water. then put beans in fresh water and simmer for about 1.5 hours. Some information on adzukis from "Ayurveda: A Life of Balance"
This bean is also known as aduki or feijao. If mung is the king of beans, this is the queen. A small, reddish-brown bean, adzuki is native to Japan and China. In Japan, the adzuki is coarsely ground and used as a facial scrub. It leaves the skin glowing and silky. Rich in nutrients, it is considered, like mung, to be a tridoshic bean. We get to eat one of these big guys almost everyday. mmmmm....papaya is good. 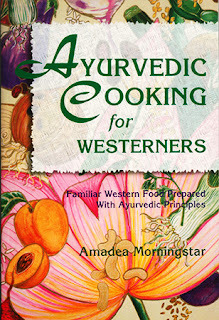 Here is a book that myra highly reccomends, especially for those of us accustomed to western foods. Morningstar, Amadea, "Ayurvedic Cooking for Westerners"
Myra made the most incredible pizza last night. the crust, in particular was out of this world! the recipe is in "Ayurvedic Cooking for Westerners." On top of the pizza is paneer cheese (made by myra the other day) sun dried tomatoes, rose petals, squash (can't remember which kind), broccoli and zuchinni. The mixture will begin to hold together in a ball. Turn the dough out onto a floured surface (like your clean kitchen counter) and knead it lightly a dozen times. Lightly oil a 12-inch round stainless steel pizza pan and press and dough into the pan, making an edge for the rim with your fingers. Put it in the oven to bake for 15 to 20 minutes. (note: then put the veggies and cheese onto crust and bake for desired time to cook the toppings). Here is one of the cook books myra uses. it has a bunch of great recipes (including the recipe for mint chutney)! Tiwari, Maya, "Ayurveda: A Life of Balance"
Pictured here is dhal (right bottom), greens, rice and mint chutney (middle, light green). very tasty. The recipe for the mint chutney is from "Ayurveda: A Life of Balance." Grind all ingredients, except yogurt, together in a suribachi. Store in a glass jar and keep in a cool place. Mix in yogurt dircelty before serving. Welcome to meandering food, the companion blog to my meandering travels blog. Here, the focus is on the food that z + i are eating every day on our current travels. Right now, we're staying with Myra Lewin at Living Yoga Maui, a great retreat from the world. The cooking here is done by Myra (and others in the house) and is "Ayurvedic," which means that the meals are prepared and planned with an emphasis on using the 5000-year-old east Indian traditions to create therapeutic nutrition, food, and healing. The food is very different, but very tasty and healthy. Since the house also has an organic produce garden for fruits and vegetables, many of the items we eat are grown here, by all of us. I'll be posting recipes, photos of meals and food prep, and our smiling faces as we eat the results!